We all like to receive compliments, do we not? As the years roll by, I find that I like them more and more. They are usually prompted by my clothes, for I try to be meticulous in matters sartorial. There are various ‘hot spots’ for such compliments – places in which they are given with such frequency that I positively glow with satisfaction. One such is State Street, Santa Barbara – perhaps the most elegant thoroughfare in California. 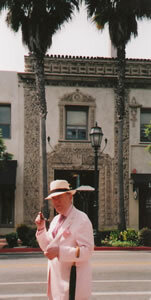 Here I can sit on an oak bench, enjoy the sunshine and, from time to time – and usually when I am wearing my pink seersucker suit (pictured, on State Street) – acknowledge the kind remarks of smiling passers-by. This was a particular pleasure on my recent visit, for my hotel was only a few steps around the corner. Indeed, I was staying at the only luxury hotel in the centre of town – the Hotel Andalucia. The Hotel Andalucia is five stories high. For the centre of Santa Barbara, that is high, and the hotel towers above its surroundings. This height was achieved, in this affluent town of severe planning restrictions, only because its exterior was built (in 2004) as an exact replica of what had been there before. It means that, from the rooftop pool and terrace, there are gorgeous views of both the Pacific Ocean and the Santa Ynez mountains. I had driven from Los Angeles and I was rather tired as I turned the motor into the covered driveway near the corner of Carrillo and Chapala Streets. Half a regiment of young fellows at the entrance sprang into action. My luggage was extracted, my car was whisked away and I was shown inside. My spirits revived at once, for my surroundings were spacious and elegant. All around were expensive fabrics, pieces of good carved furniture and high quality paintings of the modern sort. 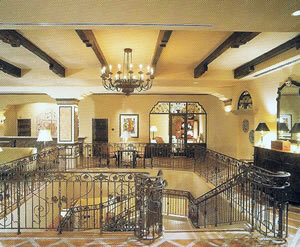 The tone was light and comfortable – which is appropriate for a hacienda. 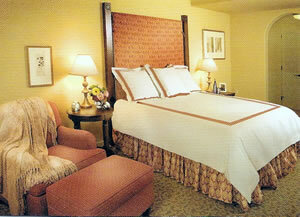 The decorative theme was continued in Room 514 (a ‘courtyard junior suite’ and therefore $588, breakfast extra). Louvred double doors led from the hallway to the bathroom and the entrance to the seating area and the bedroom was marked by an archway. Yellow was the dominant colour, with dashes of gold and brick red. Five table lamps, two televisions, a marble-topped coffee table and a proper, round alarm clock on the bedside table contributed to the sense that this accommodation had been intelligently planned. Its cheerful atmosphere extended into the bathroom (also yellow), with its separate shower, separate loo and splash of bright Spanish tiles. Its air conditioning was, of course, quiet and efficient. Downstairs, in the ground floor restaurant, ‘31 West’, Executive Chef Michael Reardon holds sway. I liked this large chamber, open to the lobby. Its potted palms and its tiled floor seemed right. I was not able to try lunch or dinner here, but I did have breakfast. I sat in one of the wicker chairs and had brought to the large table orange juice, cornflakes, poached eggs, bacon, tomatoes, toast and Earl Grey tea – all of excellent quality and freshness, and all for about $25. 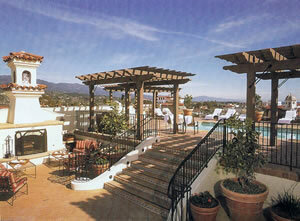 The Hotel Andalucia offers charm, style and great comfort in a remarkably convenient location. I recommend it to you. A ten minute stroll from the hotel I found one of the most impressive wine lists in Southern California (and one of the most charming sommelières, Cheryl Stanley) at a restaurant called Wine Cask. Even for its French content alone, this cellar would be the envy of many of the top restaurants in France. You may judge its quality from these offerings of claret from the famous 1961 vintage: Latour ($2,600), Mouton-Rothschild ($2,475), Margaux ($1,700) and Haut Brion ($2,475). My own, local white (Palmina Tocai Fruilano, Honea Vineyard, Santa Ynez Valley, 2005 - $48) had flavours of melon and kiwi and reminded me of a marsanne. The standard of the food was less impressive. My meal of tomato salad, lamb ravioli, a pork chop and white peach galette ($67) was adequate rather than exciting. Still, with deep pockets, one could drink like an emperor in this high, spacious room. On my way back from dinner I received yet another compliment. How I like Santa Barbara! Its citizens obviously know a good thing when they see it. 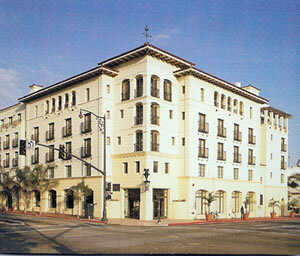 31 West Carrillo Street, Santa Barbara, California 93101, U.S.A.
813 Anacapa Street, Santa Barbara, California 93101, U.S.A.